Stephen Osborne, Bluecloud IT. 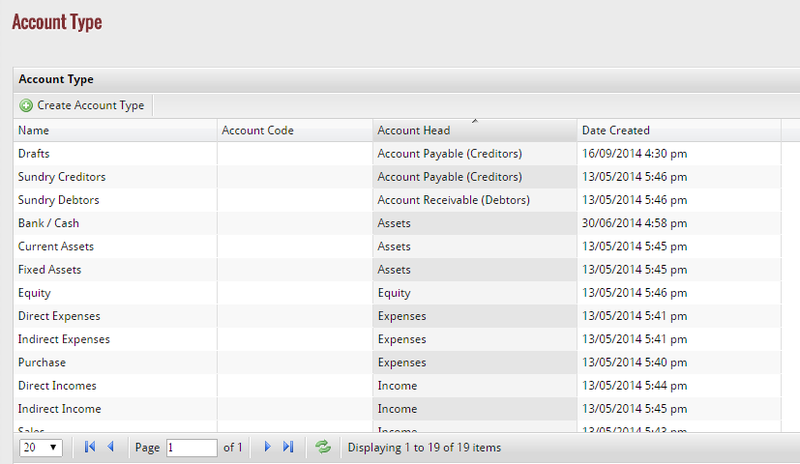 myERP customer. GoERPbaby is an enterprise resource planning solution that enables organizations to incorporate smoothly diverse teams, function, processes, and systems. The ERP platform, with built-in CRM and HRM capabilities, offers organizations sharp insights into and control over operations across the value chain through a single application. The A/P Aging Detail Report will show you all the invoices you have received from vendors along with the total amount you owe. Top 10 Customers reports help you in getting the details of top 10 customers who buy a significant number of products from your organization. With this report, you can see the top 10 products of your organization that generates higher sales as a comparison to all other products. Top 10 Customers reports help you in getting the details of top 10 vendors of your organization. This report is a more detailed version of the standard balance sheet report. For each account, the report shows the starting balance at the beginning of last month, transactions entered in the account for this month to date, and the ending balance as of today. Category, wise sales report, helps in creating a report for the sales for products based on any particular or all categories. With Comparative Sales report, one can create a report of the total revenue earned by their organization. This report shows year-to-date transactions for each income and expense account. The Sales by Customer Summary Report will tell you what the total sales for each customer as well as the total sales for each job. GoERPBaby provides out-of-the-box reports for viewing your business data. You can create custom reports using templates as well as from scratch. GoERPBaby has a varied range of inbuilt reports that show you where your business stands. We have also designed or created the mobile application of order booking for GoERPBaby. 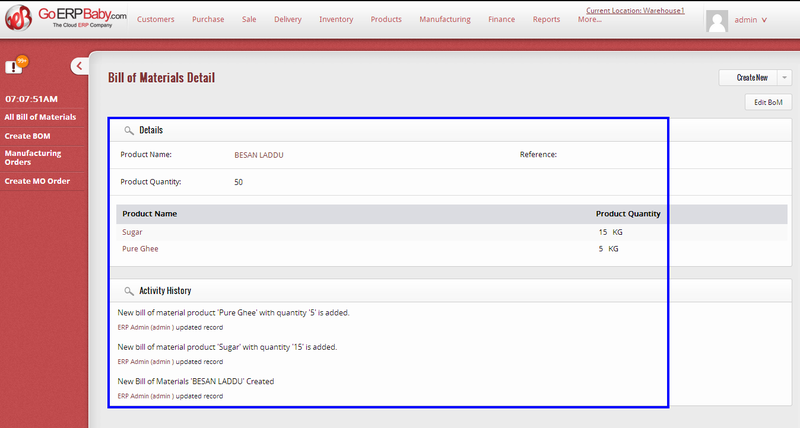 With this application, the sales person can easily book orders from Dealers and retailers. Inventory management system of GoERPBaby helps an organization in organizing the flow of an order, on the stock, damage, reserve products and provide the staff to coordinate different activities for successful inventory management. Purchase management takes care of all the procedures that are part of procurement of products/items or raw materials which are requisite for an organization. 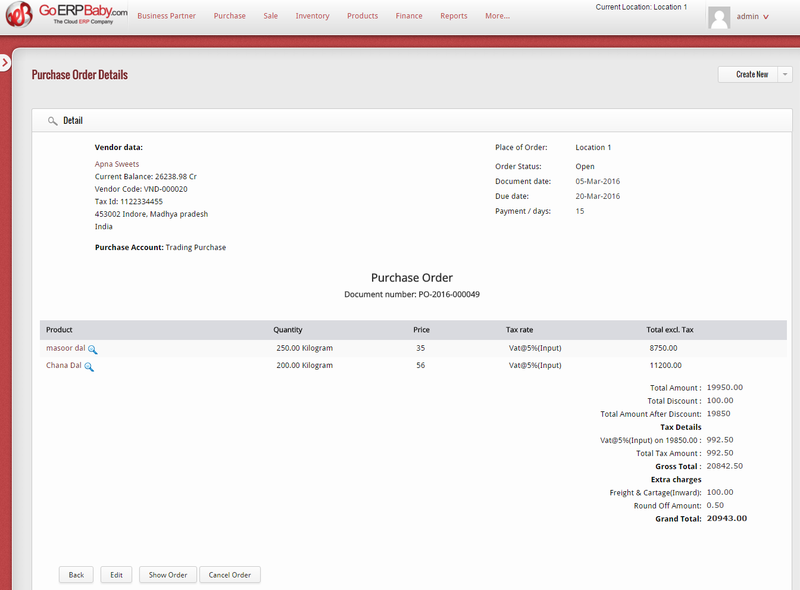 Purchase management includes functions like supplier & item linking, supplier/vendor listing, receiving & recording orders, sending an order request to suppliers, tracking purchase items, preparing receipts and updating stocks and a variety of purchase reports. Sales management of GoERPBaby seamlessly automate and integrate the entire sales processes, improve efficiency, speed up turnaround time and help you increase margins. With incorporated task and contact management, the Sales Management module is perfect for efficient and rapid movement through the sales period of your business procedure. Warehouse Management helps in managing the product and resource inventory of an organization. It aids in handling the replacement of the items and maintenance of the stock levels of the items. The warehouse management keeps an eye on the warehouse stock placed at different locations like in the shops and warehouses. Customer Relationship Management assists you to develop, maintain and enhance customer relationships. It facilitates you to capture details about customer interactions and gives a single integrated view of your client to all your customer-support teams. From product manufacturing to importing and everything in between, GoERPBaby supports your entire sourcing requirements with flexibility and easiness. The Manufacturing Module delivers control over each and every step in the production procedure, from generating orders to receipt of final products. With Quality Management of GoERPBaby, one can effortlessly manage the quality of products and get simple management of warranties and stocks. 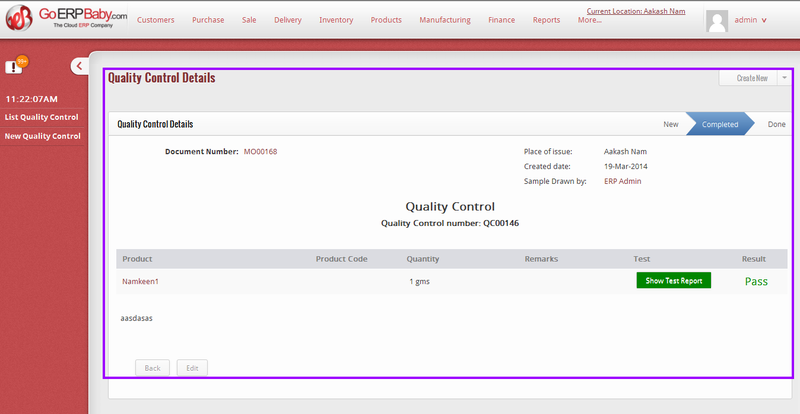 Quality Management from GoERPBaby enables you to meet compliance requirements with the ability to trace production from start to finish. Keep your accounting and finance system in sync with the rest of your company with always accurate, real-time data. Any Financial data that is requisite for running an organization successfully is now available with just one click in Finance/Accounting module. For organizing the implementation in the best way, we have divided the process into following five systematic phases. First and foremost, we identify the procedure of the company i.e. begin the implementation process with a thorough review of business operations and requirements. Keenly analyze the aspects, demanding improvement and prepare a strong project plan. Document everything to make sure our implementation team knows everything we planned. Based on the project plan, we have built a pilot system and validate the business analyzed processes. Prepare a system, better known as to meet requirements as much as possible. To give the best kick, populate the system with the Master Data, forming a solid foundation for the future processing of the industry. Evaluate the configured system using entering trial transactions. Execute end-to-end testing to ensure complete operational acceptance as per customer requirement. Re-configure the pilot system until the acceptance of the client is achieved. On successful accomplishment of UAT i.e. User Acceptance Test, a decision, on whether to proceed with the go-live or to defer until any critical issues are resolved, is made. Once, the issues are resolved, our implementation team prepares the production environment leading the go-live milestone. Post-implementation support – the most valued part of implementation when the switch is ON. Adequate resources, quick responses along with harmonization of efforts are the key factors to success. Being an important part of delivering successful implementation, we use a proper on top of the prompt support plan.